You can check out the SCS colour challenge here. We were to use Close to Cocoa, Bashful Blue and Certainly Celery. 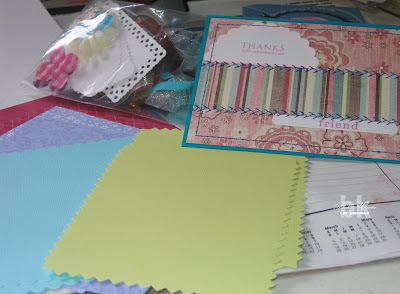 What a fab combination and it just so happens I bought the perfect paper last week to complete this challenge. I picked up Bohemia Christmas by MME. I love their Bohemia line, everything in it, and the colours are, you guessed it, close enough to Bashful Blue and Close to Cocoa to be used for this challenge. The card base is Certainly Celery, then I put on the DP and the square, which is mounted on Certainly Celery, is from the page of tags enclosed with the paper. 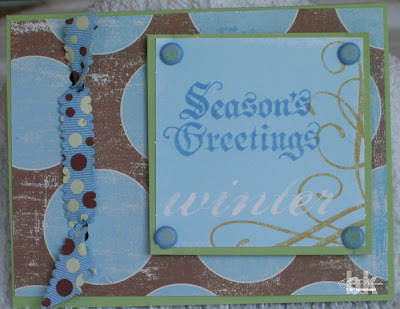 The only thing stamped on this card is "Season's Greetings" in, what else, Bashful Blue. If you look closely at the brads, you will see that they are blue, but have a green snowflake on them, too! What luck, I say. I added a dash of L'il Davis Designs ribbon and there you have it. A Christmas card fit for your best pal. For those of you who are not members of the Fan Club at SCS, the gallery of all these cards that are being created for this special event will be open for public viewing later in the month of August. When it happens, I'll make sure to note it here so that you can all go see what all the hype is about. This card is a combination of two of the four challenges posted today for the Dare to Get Dirty challenges. The layout is a sketch challenge and the other challenge was to use chipboard. I started with a Cameo Coral base. I then took a piece of chipboard and covered it with DS DP from SU Spring '07 Mini Catty. The circles are the reverse side of the striped paper. I plonked down a chipboard circle and punched out a couple of holes with my Crop-a-Dile to poke the ribbon through. I still thought it needed something, so I added some crystals for a bit of bling. I may go back and stamp Thank You on the card somewhere so that it will actually have a use! In looking at those circles again, I may have to invest in a Tag Rim maker thingie. Anybody know where to get one! I could do cards from A - Z, but that post would be enormous, so it's just A - B for Anniversary and Birthday! My brother George and his lovely wife, Jeanne, will be celebrating 50 years of marriage in September. What an achievement that is today. I was thinking about what type of card to make and wanted to do something with an elegant feel to it. But you know what, I'm just not the elegant sort. I just had to add this Stamping Bella image, which I embossed with Egyptian Gold embossing powder, which is a tad more sparkly than regular gold ep. I'm not afraid they'll see this card, because they don't know about this website. I didn't tell my brother because I just can't see him sitting down to go through it and ooooh and aaahh over my cards. He's much older than I am and already thinks I'm enough of a pest! This is the B card! A birthday card for Jeanne, of the couple above. She will be celebrating her birthday on August 7th, so it's going in the mail today. Another Stamping Bella image which recently came into my possession. I love Veggiebella. 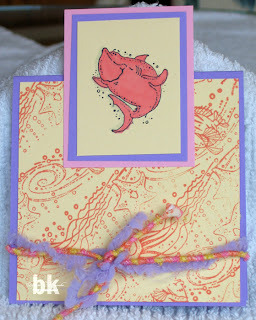 This card is also my entry for the Weekly Challenge #14 over at Ribbons and Ink. I was lucky enough to win last week's draw and wish to thank Heather for offering up these challenges. They really make me get busy and do my cards. I chose colour combination #35 which was Mellow Moss, Close to Cocoa and Regal Rose. Love combination, I think! Thanks agian, Heather. Now I'm off to check out Dapple Designs to see what the color challenge will be for this week. See you soon. This card is for the Dare To Get Dirty event at SCS. The technique was provided by labullard, a Dirty Dozen Alumni. Please check out her gallery of fantastic creations. What a great technique and easy, too! It gives a wonderful raised effect to the image. This is how I did it. I stamped my image on vellum. 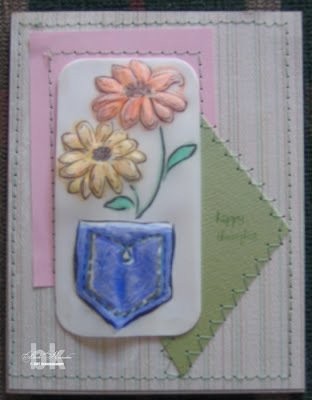 I placed the vellum on an embossing pad and used the large end of the stylus around the outline of the stamp. Then, I turned the vellum over and rubbed the entire stamp with the large end of the stylus, and then went over it again with the small end. Then, on this same side, I used my Prismacolor Markers to colour in the image. I found that using darker colours gave a better colour because when you turn it over, you can see the muted colours on the side that will be visible when you place the finished image on your card. 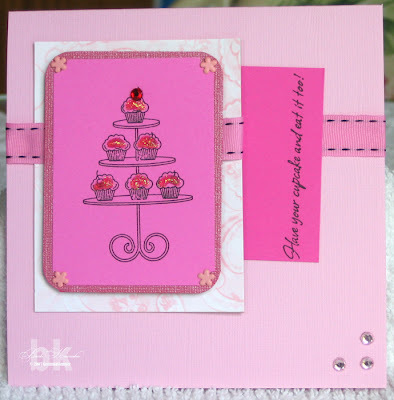 Another tip was to use a dimensional when adhering the image to the card so that it will retain it's raised embossing. I used White Perfect Puff for this. That's the stuff that comes out looking like a white glue, but when you use the heat tool on it, it goes all puffy. It provides the perfect cushion to stop flattening. ED NOTE: Kim in her comment, asked when the Perfect Puff gets heated? As soon as I put the Perfect Puff on, I heat it so that it goes puffy. When it's dry, I put the vellum stamped & puffed image onto a piece of white cardstock that is exactly the same size (another tip I forgot to mention). This allows the colours to really show up well. On top of all that, this is a layout of my own making. It's really simple, but it's mine, at least to the best of my knowledge! I opted to do machine stitching as I really like that effect and I'm hoping that the more I do it, the straighter my stitching will become! LOL! 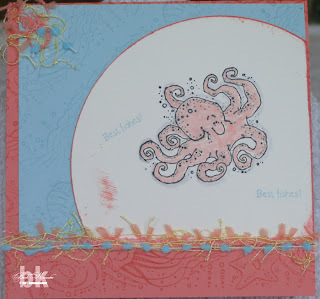 I also started this card today, using one of my newest Stamping Bella additions. Please welcome, Huggybella. It is a pocket card, I just haven't figured what's going into the pocket yet! I apologize for the poor quality of the photo. I must have been shaking when I took this photo. I'll do better next time. Only had time for one card today, but it does combine two challenges from the Dare To Get Dirty series at SCS. First it was a sketch challenge by Julia S. Then, I combined it with the challenge by Cambria to use only pink and this card is the result. Check out their galleries for some beautiful cards and buckets of inspiration. This stamp arrived in the mail today. It is by a new Canadian company, Inkspirations, which is owned by our very own Sherry Graves of The Stamp Shack fame. Sherry recently started this company and so far, I've bought both of the plates she is currently offering: Sandy the Crab and Cupcakes. I know she is going to offer more and you need to visit regularly to ensure you don't miss a thing! I'm looking forward to Farm Faces which says "coming soon" on her site. And better yet, her prices are very reasonable, so ladies, GO SHOPPING! I've wanted cupcakes for some time now, and when I heard Sherry was going to make some I waited just for hers. I'm very pleased with them. This is just one of the stamps on the plate. The other is a large, individual cupcake with icing, sprinkles, candle and cherry as separate stamps. Sandy the Crab is great, too. Come back soon and you'll see him scootin' around here! First, you can click on any photo for a larger image, if you want to see the details. Starting on the left, we have a combination of challenges from Wednesday. This photo combines the challenges of genie1314 and SweetMissDaisy. In lieu of details, I have linked their galleries so that you can see the talent of these ladies. 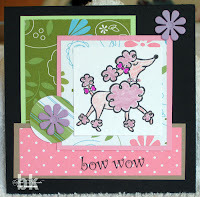 Genie1314 provided the sketch and SweetMissDaisy challenged us to make cards using pet stamps and the 'bow wow' card was born. It makes me think of my sister, Shirley, who has a neurotic poodle named Sassy. I can say 'neurotic' here because Sis doesn't own a computer and has no desire to learn, therefore, I'm safe! 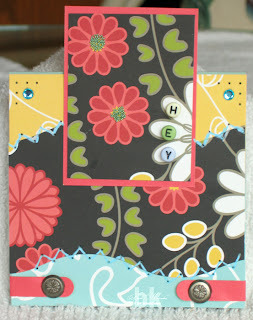 The centre card, also a Wednesday challenge by StamperSharon. 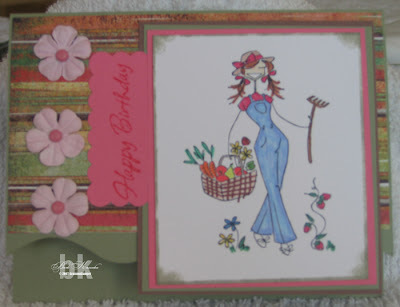 We were tasked to create a card with a 'toile' feel to it. I think mine turned out pretty good. The image is a PSX stamp and I picked it up in a stamp exchange with some ladies at The Stamp Shack. And, lastly, the card on the right. We've finally moved on to Thursday challenges and, once again, have combined two challenges in one card. The sketch is by Beate Johns, and we were to use *only* clear stamps as set out by Genie1314 (her gallery is linked above). 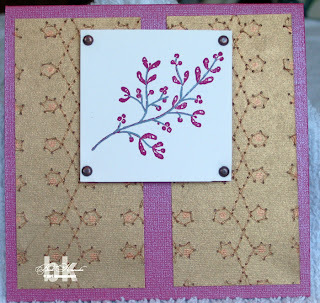 I made this card 6 x 6 because I just find Beate's sketches work well in this size and it gives me lots of space to use lovely papers and flowers and stuff. Believe it or not, I have missed a couple of challenges, mostly because I am lacking some of the supplies (if you can believe that, my DH doesn't!). And now, here is it Friday and more challenges are coming out in a couple of hours. This is so much fun and I'm having a blast completing them. For me, challenges are my MUSE. I used to have a motto about my working life, long, long ago: "I'm so naive I don't know that I can't do it!". Apparently, this applies to challenges as well and when one is put before me, I must tackle it. Thanks for stopping by, I'll see you again, soon, I hope. SCS is having a special event this week for those people who are members of the Fan Club. In order to respect the rules of this event, I cannot provide any details of the challenge, but can only display my card. So, this is it. It was based on SC 134 which you CAN see here. As it turned out, I didn't get a chance to upload it into that gallery because we went out in the afternoon. Just before bed last night, I decided to check SCS for today's challenge. I was really miffed to discover that I had forgotten all about the Dare to Get Dirty Challenges. Once I looked at them, I realized that the card I had completed in the morning was perfect for one of the challenges. I can only conclude that I must be psychic! Tami, so glad you're back! I'v missed you, girl. The photos of your vacation are beautiful. Your DH takes marvelous photos and has a wonderful descriptive way with words. Well, now that you're back, the colour challenges can continue. This is my card for the latest colour combo of pink, purple and yellow. It is a tent card that was the Sketch Challenge 134 at SCS, so it's doing double duty today. Everything on this card is by SU, except for the funky fibres. It was a a lot of fun to make, as I'd never done a tent card before. The card base is 4.25" x 4.25" and the tent part sticks up 1". This allows it to fit quite nicely in the envelopes we use most often. Thanks for a terrific challenge, Tami. I tell ya, I've been in my stamp room for three hours solid. When I stood up to come out to photograph my cards, I could barely walk. But I'm a happy camper. I have really missed it while away, so I'm cathing up now! This SCS challenge was two weeks ago and I can't believe I missed it. 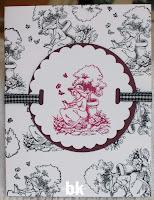 Charmaine, of Oodabug Alley, is one of my absolute favourite stampers and I love her style. So, late or not, here is my card in honour of Charmaine. 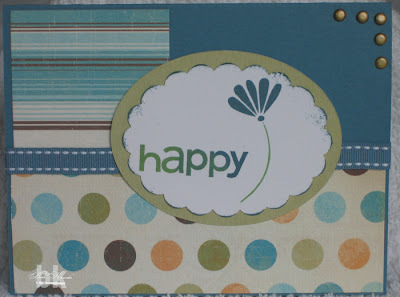 I got to use my new cardstock and stamps from the Winter Catty and I love them. Here is the card I chose to CASE. Here's to you, Charmaine, and thanks for all the inspiration I receive just reading your blog. 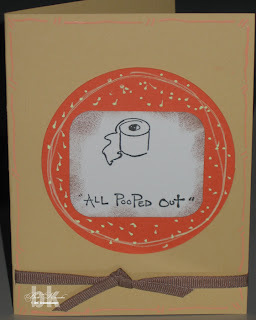 I found this challenge at Stampin' When I Can (is there any other place with such good info?). It's for Reach for the Stars' DivineMissM. The card is approx. 5" x 5" and uses Bazzill Bling. It's actually a left over piece from the previous card (dontcha' just love being able to use an entire piece of cardstock with no waste?). Again, got to use my new stamps and colours on this piece, too! It's a very simple, but elegant design and I love doing it. The inside has a stamped sentiment. Thanks for the Challenge. Well, I did this card, also found through Stampin' When I Can, but I don't think it will be acceptable because I goofed up. It clearly states on the Ribbons and Ink blog to use one of the colour combinations set out by Heather for the challenges. I went merrily on my way cutting, pasting, stamping and colouring and when it was all finished, then I realized my goof-up. But you know what, I'm okay with that. It was so much fun using this set that I'm happy anyway! So, Heather, check it out, but if I can't be entered in the draw, well, okay. Thanks for the challenge. Well, that's it for today, folks. I must get on with my day and get some errands completed and the mail picked up. Thanks for stopping by. See you next time! I don't always like the cards I make! 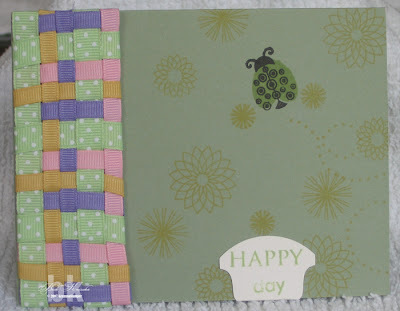 This left card is one I made just recently using ribbon weaving as a focus. 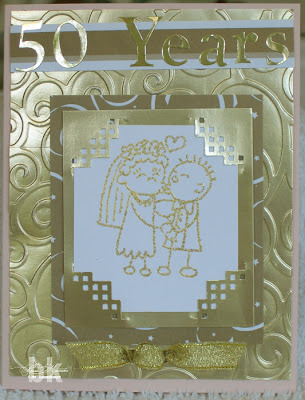 I loved the effect of the ribbon, but was really dissatisfied with the rest of the card. It was just 'blah' to me but for the life of me, I couldn't figure out what to do. I knew is was going into the Makeover Monday pile and that one day, the perfect idea would come to me. Well, today is the day. It may not be perfect, but I feel better about it anyway. The right card is the made over card. I removed the ribbon, which had been attached to a piece of cardstock, from the first card to use again. I cut the cardstock from some pink I picked up at Michaels. The quality isn't the best, but it's okay. 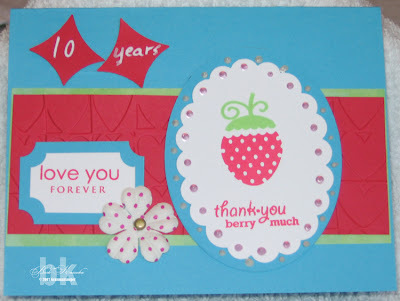 Then I took a piece of patterned paper and covered the entire card front. I attached the ribbon at the top. 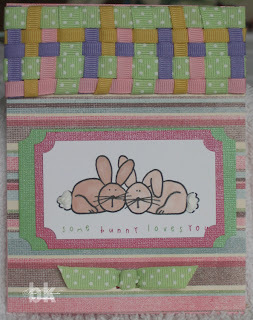 After picking through my stamps, I settled on these bunnies from Gina K. Designs. (Love her stamps, BTW!) After stamping them on white, I double-matted them using colours similar to Purely Pomegranate and Wild Wasabi. I say similar to, because they are Bazzill Bling bits I found in my scrap drawer. 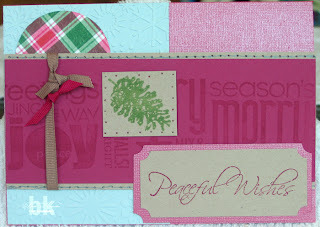 As you can see, I used my 'ticket punch' for the corners as I love this effect. Then I used my Karen Foster Snap Stamps for the sentiment, "some bunny loves you". After looking at it for a while, it still looked not quite right. I thought it was a bit top-heavy with ribbon, so to balance it out, I put a small bit of ribbon under the stamped image and called it done. Oh, it feels so good to be in my craft room again. I had a fine time this morning catching up on some challenges. The first card is for Tracy's Happy Place. Each month Tracy puts up a sketch and we create cards based on that sketch. You can see July's sketch here. This is my card. 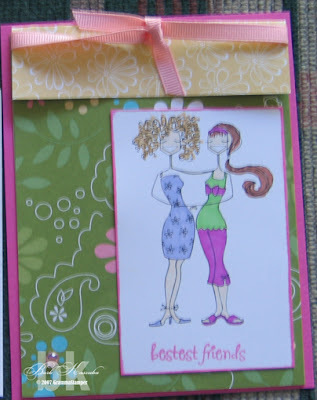 My next card was made for Beate's Weekend Sketch Challenge - 11 which you can see here. I broke open my new package of the In-Colors and used Blue Bayou for the base. I must admit, though, after being away for a bit, I just sat there looking at all the supplies and couldn't figure out where to start. Heaven forbid I should ever take a 3-week holiday. I don't know what would happen to my creative brain, such as it is! Anyway, it finally kicked in and this card is the result. I jus got back last night from my visit with my family in Guelph (near Toronto). Here's a picture of Jack on his birthday, eating his cake! I thought I would post this because I don't have any cards to show you. I've been busy unpacking, doing laundry, getting in groceries, catching up on the news with DH who stayed home and trying to read all of the blog postings I've missed over the past nine days from some of my favourinte bloggers. I've promised myself that tomorrow morning, while DH sleeps, I'm going into my stamp room and not coming out until I've got some cards to post here. After all, I've got to use my new 'in colour' cardstock I now own. YIIPPEE! Thanks for hanging in and tomorrow should see some cards, and a Monday Makeover on, what else, Monday! On Saturday, I attended an Open House where my son, Andrew, works. 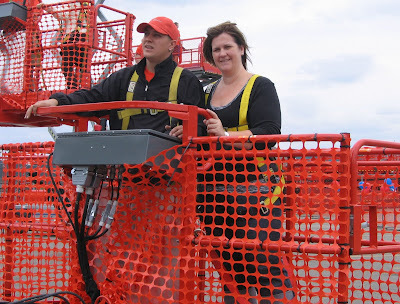 He builds and services scissor lifts built by Skyjack in Guelph. Although you can't see it, I'm sitting on my scooter. Jack is sitting on my lap. He looks a little unhappy, but it was super windy so I think he's scrunching up his face against the wind. He likes me, really he does. To my DH, John, this is my new hair-do. He hasn't seen it yet and I decided to go blonde. I visited my old hairstylist whom I haven't seen in about eight years because we moved away. He hasn't changed, but he told me I looked old. I was all grey because I was using up all my money on my stamping addiction instead of my hair. I decided I was too young for grey so went blonde. How do you like it, honey? Here is a picture of my DS, Andrew. He is taking his sister, Tiffany, for a ride in the basket of a machine that is used for accessing anything that is high up in the air. This basket will go to a maximum height of 40'. This photo is just before lift-off and Tiffany is hanging on securely. She knows her brother too well to let go. That's it for now. Hopefully I be able to post again later in the week. See you soon! Sorry, no pics or cards today, at least until I can figure out how to download from my camera and get them onto here. My grandson, Jackson, is a little charmer. He runs all over the place and is so inquisitive about everything. Everytime I sit down, he grabs my cane and takes off. Uses it like a hockey stick, he does! Then, I say "ta-ta" and he brings it back to me, usually. This won't be a long post, but I wanted to let you know I'm having a wonderful time visiting with my kids. It's great to be with them again. Now, DS wants his computer back, so I'm signing off for now. I'll be back later, maybe with some photos. Tomorrow, July 12th, will be our 10th wedding anniversary. I wanted to make a card for my DH but was having trouble coming up with some ideas re colour and layout. I'm just busy getting ready for my trip to Toronto and was simply unable to focus on stamping. So, what to do....of course, visit SCS and take a challenge. This card represents two challenges in one card. 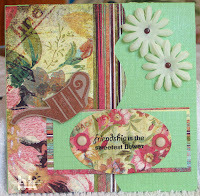 The layout is from a sketch at Poetic Artistry and is my entry for an extra number in Blogger Bingo. Now I have the layout I want to use, but couldn't even come up with a colour scheme. Off to SCS for Colour Challenge 122 which you can see here. Well, waddya know, perfect colours for a masculine, yet romantic card. Just the ticket. And SC122 was born. 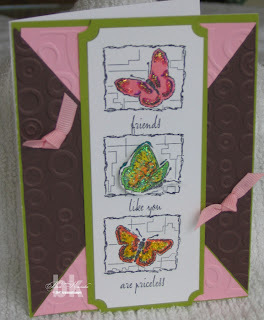 I knew I wanted to use the Hearts Cuttlebug embossing folder, Papertrey Ink's, Green Thumb had just the stamp and the new Faux Ribbon the perfect sentiment. Put all these elements together, add a touch of Ranger Liquid Pearls and I was ready to give my love his card. I had to give it today because I'm away tomorrow. Jackson is the reason I'm going to Toronto. He will be 1 year old on July 12th. I would appreciate it very much if you would leave a birthday comment for Jackson. I will print them out and put them in his scrapbook. I did this last month for Owen and it was a huge success. 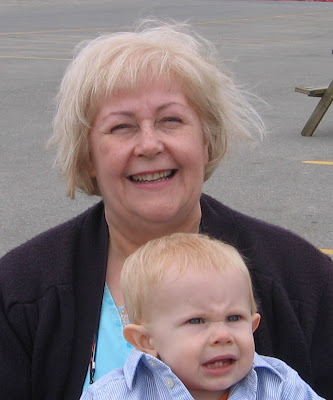 I only have two grandchildren so won't be asking this again so as not to wear out the thoughtfulness of my readers. Isn't he a little doll! Takes after his Grandma, of course. 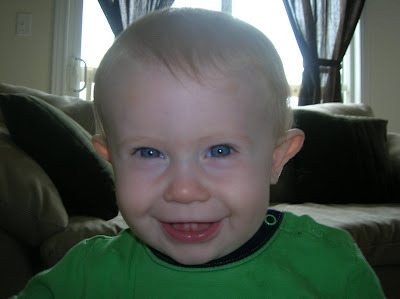 Just kidding as he's a wonderful blend of features from both his parents, Phil & Kristyn. Yesterday my computer crashed and had to be taken to the Computer ER for emergency medical attention. I'm happy to say a full recovery has been accomplished. These are wonderful machines when they work, right? Well, that's it for this post. Short, sweet and to the point. Please leave a birthday comment for Jackson's 1st birthday. He'll be amazed at all the good wishes from around the world. Here's a gorgeous pic of grandson, Owen, to look at instead of a new card. Doesn't he look like he's either just got caught doing something naughty, or, he's filled his drawers. I can't decide. 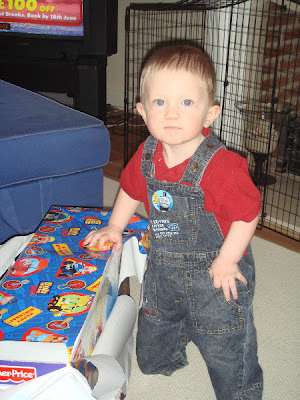 The little guy in the pic today is the one for whom so many of you left birthday comments last month. I've printed them out and will put them in his scrapbook. He had birthday wishes from so many places around the world, it was wonderful. I'm sorry I haven't posted any new cards for a couple of days, but I've been busy getting ready for my visit to Toronto. I have been tagged by Renee, to share seven heretofore unknown facts about myself. Coming up with seven is going to be a challenge, I'm not that interesting. 1. I didn't know I was adopted until I was 35 years old, but all of my relatives did. 2. I am lactose intolerant, not severely and only within the last few years. 3. I will be having bi-lateral knee replacement (both knees) most likely in late August. 4. I married a man five years younger than me. He was also my boss at one time. 5. I returned to school in 1995 and passed with a 98.4% grade average. 6. I have lived in three provinces in the last five years. 7. Writing this blog has become a huge source of delight for me and gives me something to do every day. That's it for this post, folks. I leave on Thursday for Toronto and have still some errands to get done. 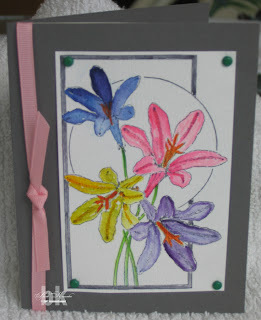 I hope to have time to stamp some cards tomorrow as I'm suffering withdrawal symptons from lack of stamping. This is my first attempt at a video tutorial. Thanks to my DH, John, for filming and editing this project. If, after watching, you have any questions, please send me an e-mail, found in my profile, and I will try to answer what I can. I'm so excited. I'm heading to Toronto on Thursday to visit my grown-up children. Andrew and his lovely lady, Sheena, will pick me up at the airport, I'll be staying with Phil & Kristyn, and will see DD Tiffany on the weekend when we attend my grandson, Jackson's, first birthday party. From what I've heard, it's going to be a big bash thrown by Jack's maternal grandparents, Cathy & Randy. They live in Cambridge and have a gorgeous backyard and I'll bet they're hoping the weather cooperates as I understand there will be about 30 guests. 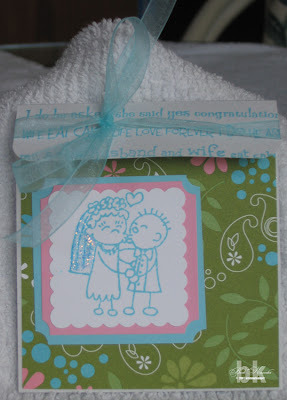 On top of all that, I'll be presenting Phil and Kristyn with this lovely pocket card. Inside the pocket card will be another crafty creation which will tell them what their wedding gift from, John and I, is going to be. They are getting married in December in Cuba and everyone is so looking forward to this wonderful event. I can't wait to see their faces when they look inside this card! Now I'm off to send them an e-mail telling them to check out my blog. Oh, how I love to tease them. What an evil Mom(in-law) I can be. BWAHHAAA HA HA HA! Just kidding, Kristyn, I'm not really evil. You have a very special place in my heart. BTW, in case I forget to give you the card, please feel free to remind me. Challenge, did somebody say "Challenge"
Why am I always a day late for challenges? Twice already I have missed the deadline for the Caardvarks 10K - 10 Day challenges, but I'm damn well posting them here anyway. So there! I just received these stamps on Thursday from Stamps by Judith and there was a sense of urgency to do something, if you know what I mean (wink). I inked them up and stamped away. These are the results. After they were done and I was 'blurfing' away at my PC, I visited Caardvarks only to realize I was late, again! However, while 'blurfing' I also visited Am I a Scrap Addict?? and, lo and behold, Deanne had a sketch challenge. 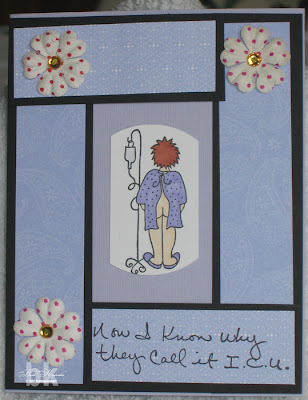 The card on the left is my entry for Deanne's challenge. Actually, let me get the order straight for you. I made the card on the right when I received the stamps, I saw Deanne's challenge this morning, so made the card on the left, using the same stamps. That's when I realized that the same stamps had been used in two different ways and could, therefore, have been entered into the Caardvarks challenge. Confusing, you bet! but that's my life. This is the card I made for todays challenge, WT120 - Ribbon Revisited at SCS. You can see the challenge here. I had seen a card using this weaving technique for ribbon in a magazine some time ago and I had wanted to give it a go. Today seemed the right time. It looked so easy, but I can tell you, it's not. The card in the mag showed ribbon so straight whereas mine is somewhat crooked in spots. Another thing I learned is to use a completely different ribbon for the crossways weave, that way the left edge will not be so bland. However, it took me about two hours so I wasn't about to change it, but will make sure I learn from it. 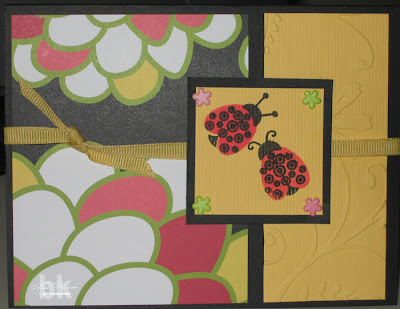 After spending that much time on the ribbon, I didn't want it overshadowed by some fancy image front and centre, so I subtly stamped my favourite flower images onto the cardstock, added the ladybug and tag for focus and balance. I think it's okay, not my best and will probably go into a Makeover Monday in a few months! But now, I need a nap to ease my tired eyes. ED NOTE: It has come to my attention that Caardvarks is having a 10K - 10 Day Challenge. The cards below fit the requirements for Day 1, so I'm going to enter them into their Challenge. The challenge will continue through to July 15th, so go check it out. Thanks to Allison for posting the link to this great challenge. A while back, Laura from Whirlpool of Imagination posted a card sketch her 4 yr-old DD, Meg, made up. She then put all entries into a draw and I was the lucky winner. You can see that card here. Yesterday I received the stamps as the prize and here are two cards I made up using two of the stamps. The third card using the last stamp will be posted another time as it has a more whimsical flavour than these two. I just love them and want to thank Lauren and Meg for drawing my name. 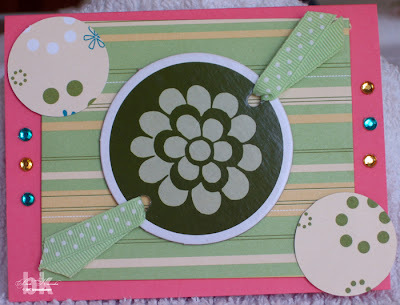 The card on the left, with the butterfiles, is also my entry from CC121 at SCS that required us to use Chocolate Chip, Pretty in Pink and Old Olive. The card on the right, the flowers, was coloured with Peerless Watercolours. I'll get the hang of watercolouring eventually, I guess! There's lots of places where the colour is just too heavy, or not blended correctly. It just doesn't look 'right' to me. Flowers and Bugs, Oh Yeah! This is the card for today's challenge at SCS. You can see SC131 here. I find myself reaching for the Little Lady stamp from Papertrey Ink over and over again. I love that set! Because of a comment someone left on an earlier post, I found a new blog. 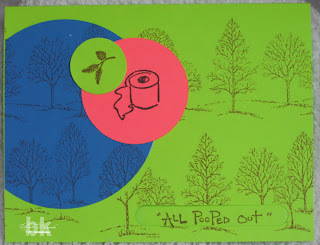 Corie has lovely cards there, but what really had me laughing out loud was the "What Are Your Bathroom Habits". It was on a sidebar, but I had to put mine front and centre. After you finish finding out what your bathroom habits are, fly on over to Creations by Corie. Tell her Barb sent you. You are a giving soul. Way too giving in fact. You often get stuck doing the dirty work that no one else will do. Your idea of fashion is jeans and a t-shirt. Clean, if you're lucky. You have the perfect blend of confidence and class. You're proud of who you are - but you don't broadcast it. In relationships, you tend to take care of your needs first. You can only be with someone who's as independent as you are. What Do Your Bathroom Habits Say About You? ....of the 10K Blog Candy is Heather Leech. I used random.org to pick the number. There were 16 comments, two people each left two comments. In order to level the field so everyone would have an equal chance, I asked for a random number between 1 - 14 and twelve (12) was the winner. Here is a picture of what you will receive, Heather. There is a selection of ribbons, both sheer and grosgrain, some Prima flowers, a few sheets of Pallette O'Prints by SU and some decoratively edged cardstock. Oh yeah, and a card I made for you. I hope you enjoy your 'candy'. All I need from you now is your snail mail addy. Just send me an e-mail to stampingramma@tbaytel.net and I'll pop them in the mail to you as soon as I get the information. Thanks for the well-wishes, ladies. 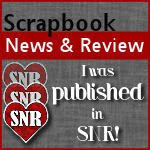 I'm feeling much better now and should be back into my craft room tomorrow morning, bright and early. WOW! The time, as I write this, is 11:05 a.m. on Monday, July 2, 2007. My counter shows 9,926 hits. When will I hit 10,000 or more? Just post here when you think I will break 10K. If you want to take a stab at the time and date, you will be entered into the draw for some Blog Candy. Deadline for your guess will be Tuesday, July 3rd, 10 a.m. EST. Don't know what yet, because I'm feeling under the weather today. But, I'll figure something out and them come back to edit this post and put in a picture of the 'goodies' on offer. Thanks for coming around and reading what I put here on my blog. It inspires me (when I feel okay, that is) to go make more cards and challenge myself. There's no Makeover Monday because I'm feeling poorly, but I'm sure it'll be back next week.